If confirmed, Verma will have a large role in the current administration's plan to repeal the Affordable Care Act (colloquially known as Obamacare), come up with a replacement plan, and possibly in the privatization or elimination of Medicare. In summary, her job will be to reduce federal spending on public insurance programs. Her background of reshaping the Indiana Medicaid program shows that she is certainly capable of meeting that objective. Seema Verma received her master's degree in public health, focusing specifically on health policy and management from the Johns Hopkins School of Public Health in 1996. She is best known for founding SVC Inc. in June of 2001, a health policy consulting form of which she is still the president and CEO. SVC has worked closely with Medicaid, expertly maneuvering within the Section 1115 Medicaid waiver program, which allows states to apply for program flexibility to test new or existing approaches to delivering Medicaid and CHIP. Her most notable achievement is architecting the Healthy Indiana Plan in 2006, a plan that was later considered a conservative alternative to the Affordable Care Act. "This is a formidable challenge but I am no stranger to achieving success under difficult circumstances." 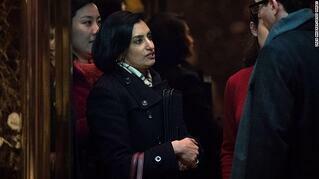 As the Administrator to CMS, the Obamacare Insurance Market would be under Verma's control. During her confirmation hearing, she declined to share the specifics of her policy plans. She instead deferred to Congress, stating that the direction CMS heads in is up to the legislation they decide to pass. In the absence of a detailed plan from Congress for repealing the Affordable Care Act, we can only speculate on strategies Verma may employ by looking at her past policies. The Healthy Indiana Plan entailed low-income participants to contribute 2% of their income on a monthly basis into a health savings account to pay for their medical services. This plan has been highly praised by Tom Price, Head of the Department of Health and Human Services. She has also stated support for individuals choosing what kind of coverage they would like to invest in, most notably, allowing a woman to opt-out of receiving maternity coverage. The Medicare Access and CHIP Reauthorization Act of 2015 (MACRA) passed with wide bipartisan support. MACRA supports the goal of transitioning from fee-for-service healthcare to value-based healthcare, through the MACRA Quality Payment Program (MIPS and Advanced APMs). During her confirmation hearing, Verma voiced her support of the passing of MACRA. She also supports the implementation of virtual groups in 2018, an initiative that should reduce the burden of reporting for small and rural practices. Verma's plans to improve MACRA revolve around ensuring that officials at CMS stay in touch with the reality of the practicing clinician. While she adamantly supports the transition from volume-based care to value-based care, she acknowledges that reporting burdens should not cut into the time clinicians are spending with beneficiaries.